Summer has officially started and as it was the solstice on the 21st, it was also la Fête de la Musique which is a music celebration taking place all over France and in 120 countries around the world. Amateur and professional musicians are encouraged to perform in the streets, under the slogan ” Faites de la musique “ (“make music”, a homophone of Fête de la Musique). It is a delightful experience to walk in a city or a village and to hear music everywhere! La Belle Vie is a song which lifts me up whenever I feel down. Originally sung by Sacha Distel, there is an updated version sung by three gentlemen. It is very classy! The TV5 website for French learners is great, you can listen to the song, as well as read the lyrics and you also have exercises to go with the song on the right side of the page. Listen to Sacha Distel here. It is a beautiful song by Patricia Kaas. When I was a young teenager, I was a big fan of her and I even went to her concert with my grandmother! (I had a super grandmother!). This song is also special to me because it is how I discovered the comprehensible approach to teach languages. I saw Susan Gross presentation at a conference for international schools and she was amazing! She put on this song to show how language learners can listen to music and acquire another language. It was my first encounter with TPRS and the natural approach and there was no turning back! Listen to Patricia Kaas here. Paroles, Paroles is a bit of a silly song but it reminds me of being silly with my best school friends. Dalida was a Italian, then French singer who was born in Egypt. She performed and recorded in more than ten languages. In this song, she sings with famous French actor, Alain Delon who tells her how beautiful she is. Dalida tells him these are only mots, words, only paroles ! Listen to Dalida and Delon here. My uncle always had a tape of Michel Sardou in his car and I remember listening to his songs with my cousins at the back of the car. This song is a beautiful ode to parents whose children are leaving to pursue their own lives. It was also sung by Louane in the recent French film La Famille Bélier, which I recommend you to watch. Listen to the song and do the comprehension exercises here. 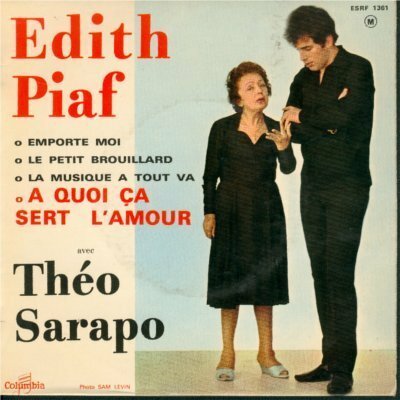 It is a beautiful love song sung by the amazing Edith Piaf and Théo Sarapo. Listen to Piaf and Sarapo here. Do activities about the song here. P.P.S. Watch my new story on YouTube, it is also about sharing bedrooms and a dog! < Learn French the natural way: bon voyage !